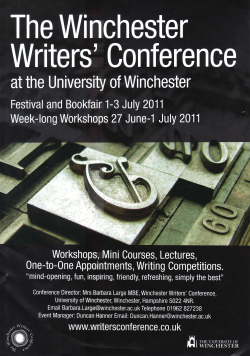 As you might have seen in my last post, or on Twitter (I’m @aliventures), I was away last weekend at the annual Winchester Writers’ Conference here in the UK. Run by the energetic, lovely and irrepressible Barbara Large, it’s a great festival of all things writing-related. So … I figured you’d like to hear about what I learned. On the Friday, Lorna delivered a whole mini-course on building characters, and gave tons of specific advice, tips and exercises. Find out your strengths as a writer, and use them. You don’t have to be all things to all people! With characterisation, you don’t have to use every method possible. For instance, you might be good at using dialogue to convey character. Physical description is just one way to show a character, and it’s hard to do well. Be precise and focus on what’s important: don’t give the reader a top-to-toe description. Think about clothing, environment (the character’s home), where they shop, any totemic items, and so on. You may or may not want to convey the character’s inner life. In some genres, like thrillers, readers aren’t expecting psychological insights. In others, like chick lit, the reader will expect to get inside the protagonist’s head. It can be particularly powerful to focus on a character whose viewpoint is limited – e.g. Christopher, with Aspergers, in Mark Haddon’s The Curious Incident of a Dog in the Night Time or five-year-old Jack in Emma Donaghue’s Room. Lorna is a fantastic teacher and writer, and if you’re in the UK, I highly recommend trying to attend one of her day courses in Oxford – you can get details on her website, fictionfire. She blogs at literascribe and you can find her on Twitter as @LornaFergusson. Write lots of different objects onto a sheet of paper: they can be completely mundane, or unusual. Cut it into slips and pick three at random. Write about a character who has all three objects. This is a guide to body language – how we express ourselves physically. It looks like a fascinating book for anyone interested in deeper characterisation, and I’ve ordered a copy from Amazon. Thanks so much for this! It was lovely to see you – and the class as a whole were a delight to teach. The random choice of objects exercise is one of my favourites too! Thanks Lorna! I really enjoyed the class – lovely bunch of people, as you say. 🙂 Roll on next year..! That writing exercise sounds like a lot of fun. I smell the makings of a good short story. Thanks for sharing what you learned. I don’t have the opportunity to make it to many conferences, so I really appreciate it. Thanks McKenzie – it’s great to know that this is useful! I have The Writer’s Journey, but The Book of Tells sounds like an interesting read. I’ll have to check it out. Very informative post, by the way! Great that you are attending such seminars, convocations and conferences. More power to you. Yes, Sherlock Holmes: wow, what a character. His cocaine habit and playing of the violin–that makes him unique. Apart from reading his works, I have also watched the TV series: Holmes is played by the British actor, Jeremy Brett, if memory serves. Brett: what a terrific actor. The romance of Holmes lives on. Have you seen the movie, “The Silence of the Lambs?” Amazing actor, Anthony Hopkins. British, I believe. It was a terrific movie, one of the most memorable in recent memory. Your post served as a reminder. Cheers.